We’ve combed through all the information online to ensure that we’ve found the best LED grow lights for weed. But our extensive buyer’s guide and FAQ are here with our reviews to ensure you find the lights that are best for you. Your growing needs are purely unique based on the combination of budget, environment, and strain. Many of the lights listed here are recognized throughout the growing community for their premier performance abilities. But there are many options here suitable for new growers who are looking to get their feet wet. Do I need Higher Wattage Lights for Better Plants? 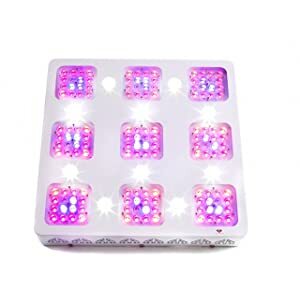 Why Should I Use LED Grow Lights? Why Do I Need Full Spectrum Lights? What is Photosynthetically Active Radiation? How Do I Know My Plants Get Enough Light? Do I Need a Grow Tent? Of all the grow lights here, the PlatinumLED Advanced Platinum Series P900 stands out because of its revolutionary technology. The full-spectrum lighting includes red, blue, ultraviolet and infrared light spectrums. These LED lights offer more intensity as any other grows light, specifically 3 times the amount of brightness. With 12 bands of lights, the wavelengths can disperse evenly across your plants. The paneling design makes up its ability to help your plants thrive while keeping the entire area free from unnecessary heat. Best of all, these LED lights work well during each phase of growth. There’s no need to switch out or rotate which lights you’re using. There is an included switch specifically for the vegetative phase and the bloom phase. The lenses shift in angle to cascade the light and encourage more growth.Overall these are the best lights available when you consider both the features and the price. The PlatinumLED Advanced Platinum Series does have smaller systems available if you want all the quality but not all the size. But, if you’re using a large space to grow the 4’ by 6’ coverage does wonders. DormGrow is a trusted brand, and the quality is worth the price. With 8 bands these lights offer a reasonable amount of coverage and run very efficiently. These lights are intended to take you through both the vegetative and blooming stages with a substantial amount of penetration. The Advanced G8LED G8-600 is one of the few light systems to penetrate through your growth as plants reach larger heights. Additionally, they’re attempting to continue experimenting with LED technology. These lights come with a bit of advice from DormGrow, the manufacturer suggests adding 90-watt red bulbs when your plant’s flower. The claim here is that adding the red light is economical, and effective. Although there isn’t a ton of science to back up this statement, the growing community is adopting the practice nonetheless. Lights are always cool enough to touch. Coverage area is true to manufacturers claims. For this price, you can get a lot more power behind your lights, but, you would miss out on some of the amazing features here. With PAR values reaching 415 and 655 Viparspectra offers another great LED light. These lights can replace a 400-watt HID and will keep your entire growing area much cooler! 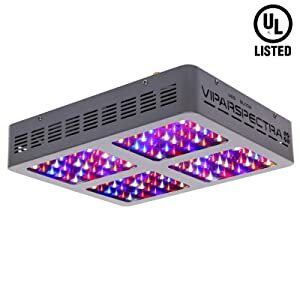 It, like the other Viparspectra reflector series models on this list, has both vegetative and bloom switched for light control. The side range isn’t wanted you would expect for the price, however. Because there are other size options available for better prices the Viparspectra Reflector Series V450 only works if you specifically have a 2.5’ by 2.5’ growing space. 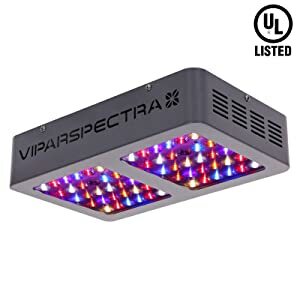 Keep in mind that we mention other Viparspectra models on this list, but this model comes up first because Viparspectra seems to cater to those growing with size restrictions here. Overall these lights are designed to meet very specific needs, including a small growth environment with only 1 or 2 plants. If these are your needs, then the Viparspectra V450 light system is a great choice for you! MarsHydro has a well-developed reputation for quality customer service and products that last for years. Because the MarsHydro 300-Watt is a light system designed for beginners, it suits a low budget but doesn’t skimp on quality. MarsHydro sticks to high-quality LEDs even when it’s designing products for beginners. Rather than using cheaper LEDs, the MarsHydro 300-Watt uses 5W Epistar LEDs to offer a brightness that many other lights in this price range can’t deliver. For new growers, this means better PAR as the light can reach more of the plant, with strong wavelengths. But, the brightness doesn’t extend very far, however, the MarsHydro 300-Watt is only suitable for 2 large plants. We wouldn’t recommend any more than 2 plants on this light, even if they’re small. Overall, it’s an energy efficient option that is usable throughout the entire growth process. Viparspectra shows up a lot on this list for a reason! The lights are quality, and the systems are designed with a grower’s need in mind. The big difference between the Viparspectra V300 (also on this list) and the V600 is the coverage area. The Viparspectra V600 is a step up in coverage area and for a lower price than purchasing 2 V300 models. While the V300 is a good option for 1 or 2 plants, the V600 is best for 5 or 6 plants. Then, after considering the price difference and coverage area, Viparspectra made sure to make it a better option on your budget to buy the V600 rather than 2 of the V300 lights. Many people on a budget are stuck between these 2 units. When you’re working with a budget, there’s a lot of weight before making your choice. But the Viparspectra V600 option has a lot of features for a very low price. The Viparspectra V600 is programmable and has a timer. So, if you can’t check in every 12 hours, this is a great option for you! This system is the “in-between” light that doesn’t suit many growers. 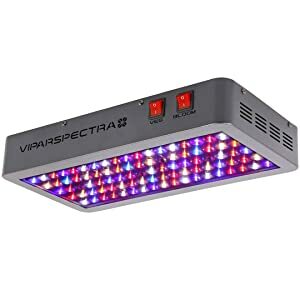 Many people, especially first-time growers, are choosing the Viparspectra Reflector Series v300. It packs a lot of benefits into a reasonably sized light and at the right price. The Viparspectra Reflector Series v300 performs exceptionally well indoors and can help you get 1 or 2 plants started. The Viparspectra brand performs well regardless of the model, and the customer service they offer is outstanding. So, if you have questions about your lights there’s support staff is on standby waiting for your call. They are also known to process refunds quickly if your trial period doesn’t work out. The Viparspectra Reflector Series v300 specifically has 12 wavelengths,and the lights are set at 90-degree angles to support a 2’ by 2’ coverage area. The LEDs themselves are of decent quality with about 100,000 of run time before they should start going out although there are reports of them dying earlier. LEDs die before the 100,000 hours but a few going out doesn’t severely reduce the amount of light. Another budget options that offer full spectrum lighting. However, the Roleadro GalaxyHydro Series 300-watt system has some other benefits. The first feature, making this a prime choice for home growers, is the size. Although the system seems small, it covers a 2’ by 3’ region. What sets the Roleadro GalaxyHydro Series 300-watt product apart from the rest of the competition is its 7 to 1 red to blue ratio. This ratio is what many experienced growers recommend for the flowering stage. The 7 to 1 ratio is ideal for bud development and can impact potency as well. The coverage size of Roleadro GalaxyHydro Series 300-watt makes it perfect for home growers who are taking care of 2 or 3 plants. But, if you have more growing then just 2 or 3 plants, the Roleadro GalaxyHydro Series 300-watt is still an option. You can link multiple units together to cover a larger area. Even if you end up buying 2 or 3 of these models, you can save hundreds of dollars. The lights are easy to daisy-chain together, so it’s not a hassle if you end up buying a few systems. The Roleadro GalaxyHydro Series 300-watt comes with a 2-year warranty, and the Roleadro customer service people are amazing. 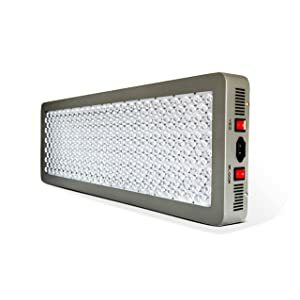 Possibly the cheapest light you could find now that is still worth buying, the Ledgle Grow Light 300W is a favorite among new growers. If you’re looking for a great value, this could be the right light system for you and your plants. 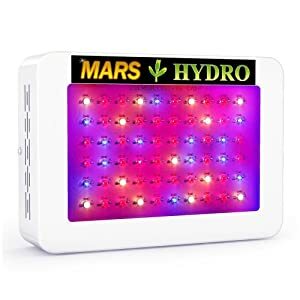 The LEDs are very large and offer very bright light.It performs well even as your plants grow taller. The Ledgle Grow Light 300W doesn’t cover a lot of areas though. 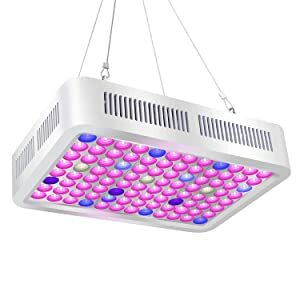 Because the Ledgle Grow Light 300W only covers a 1.5’ by 2’ region you need a few if you want to grow more than one plant. The Ledgle Grow Light 300W offers some benefits that are only seen in the very expensive models such as, vegetative and flowering stage switches. These switches allow even beginners to change their lighting strategy as their plants grow. The 11-band spectrum offers red, blue, white, ultraviolet and infrared lights. There are also cooling fans because these LEDs do get hot. So, the fans will help to keep your growing area cool despite the light. 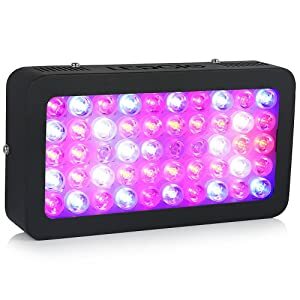 If you’re looking for a cheap option to get started with the Ledgle Grow Light 300W is a great choice for first-time growers. High-quality, American made LED lights are a huge difference when it comes to longevity. The lifespan of these lights is unbeatable, and they’re super bright. Although they don’t offer all the brilliance of our first choice, these LEDs are much brighter than your standard grow light. If you’re worried about the strain and the best lights to go with it, the AdvancedLED Diamond Series XML350 are versatile. Because of these lights have more than 14 wavelengths it’s ready to go for every stage of growth. There is another surprise benefit here that many large-scale growers enjoy, and that’s the ability to daisy chain multiple units together. This light system can handle up to 4 units on the same connector cord. If you’re looking for something that’s easy to use and can connect multiple units, this is probably the best choice for your plants! The cost doesn’t match the quality of LED lights in the system. This award-winning light system is worth every penny if you can afford it. Yes, the Kind LED K XL1000 is hands down the best light for growing weed, but at this price, we can’t say that it fits into very many budgets. The footprint is a 5’ by 5’ area. The whole system runs very coolly, so there’s no extra heat in your grow area. What makes the Kind LED K XL1000 standout from the rest is the fully customizable spectrum. Because of this, it has earned its price tag. That’s right the 12-band spectrum is customizable and programmable. So, you don’t have to go in and mess with it every time you want to change the settings. 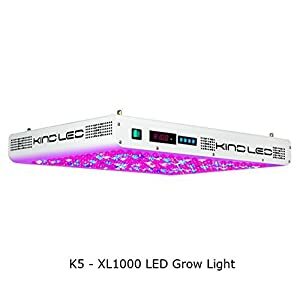 The Kind LED K XL1000 is great for anyone who plans on growing different strains in the rotation that require vastly different light spectrums. Then regardless of the strain, you can kick up the red and blue spectrums during flowering for optimal bud quality. In the end, the Kind LED K XL1000 is worth the price if you’re a dedicated grower. The few aspects listed here are all nearly equally important to providing the best environment for your plants. When choosing LED grow light for you always consider space, budget, spectrum, light control, and electrical usage. We are sure you’ll find the one here with our reviews and buying the guide. If you’re looking for lights to start your first round of growing weed, you’ll probably be better off with cheaper lights. That way you can familiarize yourself with the strain you’re growing, and which light patterns work best for you. We aren’t just talking about the space the LED lights take, but, more importantly, we’re talking about the space that the lights project. It’s important to know the exact measurements for space you will use when growing. If you’re not sure, measure now and buy lights later. Measure in metric (meters and centimeters) and get the most precise measurement possible. Each light can only deliver light to limited space. Because you want all your plants to receive ample light you don’t want to have dark outlying part of your growing space. Those plants which do not receive the same amount of light will dwarf and produce less. Space is one area where reviews outshine the product descriptions. Because the product descriptions are written to sell the product, of course, they’ll excite whatever they can. However, reviews (including the ones you’ll find here) are meant to help you find the best lights for you and your plants. A lot of the time, LED lights don’t have the light span that the sellers claim. Your budget is a just aspect to consider when buying your grow lights. Setting up a cannabis growth system is already expensive, and the increase in your electric bills is an expense that won’t go away. But having a low budget doesn’t mean you can’t get great LED grow lights. As we’ll show in our reviews, there are great grow lights available in every budget. If this is your first time growing you probably don’t want to jump into the deep end and buy the most expensive light system. Instead, first-time growers should start with cheaper LED lights, and learn what they prefer. If you are an experienced grower, there is no harm in investing in a great LED light and light system. But always be sure that the LED grows lights you’re purchasing offer the benefits you need. When in doubt of whether your budget is in the right place, try to correlate the price and the brand. Because quality brands in the growing community are well established now, it’s an easy way to see if you’re in the right budget for your experience. As a beginner, many brands cater to a first time grow setup. Together these 4 spectrums can impact your plants and provide maximum growth. The red, blue, infrared, and ultraviolet spectrums provide a wide variety of wavelengths. This combination of spectrums is a new technique in growing. But, this technique is showing substantial significance in affecting growth patterns. The yields off plants that receive a full spectrum are showing more production in flowers with healthy amounts of time spent in each phase. The bonus of using full spectrum lights that include the red and blue spectrums as well as infrared and ultraviolet is that they also use less electricity. They also last significantly longer because they remain cool while on. Although the initial cost for full spectrum lights is much higher, the cost of the lights over the life cycle of your plants is cheaper compared to other light options. Because the LED lights run cooler, they last longer, which means you don’t need to add fans to keep the temperature low. But also, they are more durable in structure, so there is less chance of them breaking. Overall you want to consider full spectrum lights because they can save you money on replacements, and electric bills. LED lights already have a head start on their energy efficiency. LED lights coming into the cannabis growing community has saved substantial amounts in electrical bills. But there is still some concern about how long the lights will hold up because they’re running so constantly. A great set of LED lights will last for months or even years while running 10 to 12 hours per day. If you’re looking at the most powerful output, you’ll need to look for a higher wattage. Typically, 1000-watt LED light bulbs are more cost-effective because they lead to less electrical usage. Light control also contributes to the durability, and longevity of your lights. Light control changes with the stage of your plant’s growth. But, you always want to make sure that your plants obtain an amount of light that is beneficial to them. Understanding what amount of light is beneficial though takes a bit of guidance and a lot of discipline in tracking how much light you’re giving them each day. For the seeding phase, you want to allow 16 hours of light. While in the vegetative state you want to provide 18 hours of light, and finally when your plants are flowing your want to split the light between 12 hours on and 12 hours off. Many people oft for a timer to control the light because any variation can directly affect the plant’s growth and potency. Whether you’re setting up for your first grow and are excited to see your plant’s life cycle, or if you’ve been doing this for years, you probably have some questions. Because marijuana growth is such a hot topic and the community is so innovative, there’s always sometime new to try or learn when growing. That’s not how it works with growing cannabis. Higher wattage lights do not equal better plants. But, it does mean better electricity bills. Wattage only measures the amount of energy drawn out of the power outlet to keep your lights functioning properly. The higher wattages may seem brighter if you compare 2 bulbs from the same brand and same technology. However, you can’t compare brightness in wattage across multiple brands or different technologies. LEDs are energy efficient when compared to HID bulbs. But, essentially, no. You don’t need high wattage. Before LED grow, lights were available everyone was stuck using giant fluorescent or sodium lamps. The downside to these giant lighting setups is that they don’t allow new growers to enter the community without hundreds of dollars invested just in lights. It also means that anyone looking to grow a few plants in a compact space was just out of luck. If you used even a compact version of old grow lights, they created a lot of heat, required fans to stay cool and ran up your electricity bill. Because LED grows, lights have become so popular it’s easy to find what you’re looking for to grow high-quality plants. Full spectrum grows lights enable your plants to reach their full potential in each stage of their life cycle. Although full spectrum with UV lighting is new in the growing community, many growers embrace the change because of the results. Essentially, you’re mimicking real sunlight, increasing your yields, and saving yourself money on energy costs. This term is usually abbreviated as PAR, and it is the wavelength that plants use to synthesize. Although the light that plants get can help photosynthesizing the wavelengths that emit PAR vary by plant. Essentially you want your plants to get as much these wavelengths as possible. PAR splits into 2 categories based on measurement. The first is PPF or Photosynthetic Photon Flux and this measure the photons available in the light. The measurement is always in micromoles per second, but what you’re looking for is a higher number. The second measurement of PAR is PPFD. PPFD is Photosynthetic Flux Density, and this measurement is more important than PPD. What the PPFD measures are how much of the usable light is hitting your plants. Clearly, it’s more important to know how much light hits your plants. Because these aren’t so easy to test at home, many manufacturers will make outrageous claims about their lights abilities. You should always question any light that doesn’t state the PPFD. Although we recommended certain hours of light per day by growth stage, you should also consider your strain when deciding if your plants are getting enough light or not. But you will compare the PAR, light coverage map, and your strain to see if your plants need light. Many manufacturers give some general insight into the area that their lights cover, but the user reviews offer more consistent dimensions. 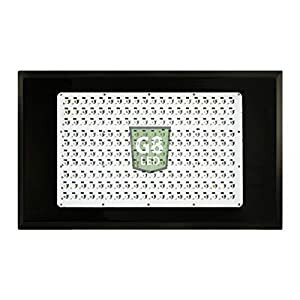 With this, you can draw up a coverage chart or map, but many manufacturers will include one with your purchase. The manufacturer provided maps often include the PAR values and how height affects these values. A grow tent can make growing outdoors substantially easier. If you’re working with an enclosed environment, you might think you don’t need further protection from outside forces. However, numerous factors from within your already enclosed space that can affect your plants. Many people growing in the house don’t account for cleaners they regularly use, the air conditioner vents bringing in cold air, the air in a small space going stale and your plants not getting any circulation. But, you can grow outside with a grow tent and have far more control over your plants than growing indoors. Always review grow tent options before buying because various brands fluctuate in quality severely. Look for quality poles, durable materials, and light control. This buyer’s guide and our top 10 best LED grow lights should help you in choosing which lights are best for you and your plants. Your current grow setup may have space restrictions, be indoor or outdoor, and you probably have a budget to consider. We’ve tried to consider all these aspects when compiling the best 10 LED grow lights, now get growing!